Difference between revisions of "DF2014:Stupid dwarf trick"
*DwarfBonus: feed any vegetables you did not steam to your dear friends, the [[clowns]]. Difficulty: Medium, raising with the amount(and respective difficulty) of bonuses you add. ≡MegaDwarfBonus≡ : Have pet kea for each of your dwarves. Essentially a Bridge-a-pult, with specific ammo. WARNING:The system can freely jam on any body parts besides hands and heads without killing undead. With the help of a necromancer, corpses your dwarves refuse to butcher can be brought back to life and re-killed to yield bones and skulls for your bonecarvers if they are mushed up enough. MegaDwarfBonus: Use adamantine spikes! On the plus side, you have a thriving coffin industry going now. UltraMagmaArmokBonus: Use one (or more!) of the following list: dragon(s), a bronze colossus(es), a forgotten beast(s) (bonus points for flesh-melting secretions), an undead giant sponge, or the denizens of the Hidden Fun Stuff. Station some soldiers at the bottom of a shallow pit and dump your captives in. You can also use dangerous animals instead of soldiers. For extra points, put the prisoners in cages connected to ramps underneath the arena floor. One lever will open both the cage and a hatch above the ramp. Variant: build prisoner cages inside the arena, link to a lever outside the arena, lock the soldiers in, and then open the cages. SurfaceDwellerBonus: get the stone for your constructions entirely from open-pit quarries, i.e. by channelling instead of mining. BabelBonus: Use DFHack's infiniteSky and build to the heaven itself. And when we says "redesign", we mean completely replanning and rebuilding the entire fortress, from scratch. 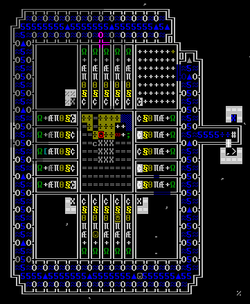 Ever thought about a cool thing that you could add to your fortress, but can't because a critical area(such as the dining room, general-purpose stockpile, central workshop area etc.) are in the way? Did you start the fortress by building the most critical areas in the first available spot? Well, now is a good time to get rid of that! For added effects, put the sleeping areas especially close to the booze stockpile so that dwarves are always happy! Usefulness: Varies depending on how you carry it out, a. k. a. the efficiency of the new organization. Usefulness: Low. Make sure to wall the pit in or it will become very Fun once goblin archers become involved.